Welcome to the February edition of my President’s Report. With this month’s issue, we’re introducing a new format for the newsletter. Instead of clicking through to view the Report, you can browse the various news items by simply scrolling down in the email, and clicking the links for more on the stories that interest you. With each edition we strive to provide readers with news and event highlights involving students, faculty, staff and alumni. The selected stories represent a cross section of activities happening both on and off campus. I welcome your feedback on the new format. I also welcome your thoughts on the types of stories you’d like to see included in the President’s Report. 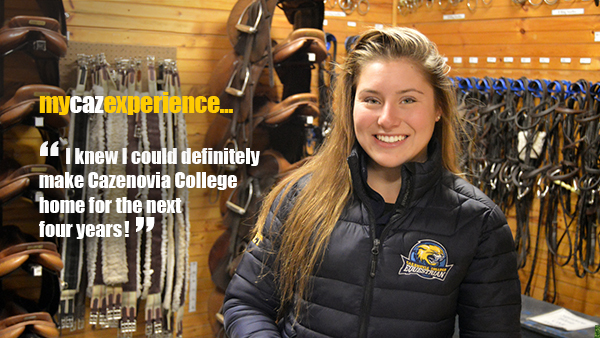 As always, thank you for your interest in Cazenovia College. This fall semester, Cazenovia College launched an exchange program for students to study abroad at Nagoya Gakuin University (NGU) in Japan, while NGU students study at Cazenovia College. The program gives students the opportunity to experience a new culture and language. Cam Wilson became the program's all-time leader in career blocked shots on Saturday in the Wildcats 78-64 win over Gallaudet University. Have You Seen Our New Campus Tour? Explore the campus and village in a new walking tour with Cazenovia College Assistant Director of Admissions, Marie Veschusio ‘17. February 1 - 27 | Student Exhibition: "Canterbury Collections"